Lindsey Vonn straddles a gate and skis out of the slalom in the alpine combined (Getty Images-Agence Zoom/Christophe Pallot). Maze was .22 seconds faster than silver medalist Nicole Hosp of Austria, and Hosp’s Austrian teammate Michaela Kirchgasser claimed the bronze. 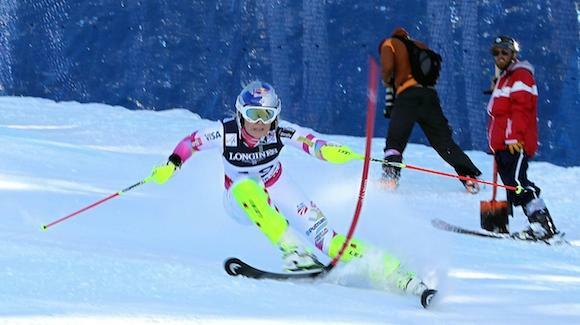 Hometown favorite Lindsey Vonn of Vail was seventh after the downhill but straddled a gate in the afternoon slalom and was disqualified. Vonn is coming off two knee surgeries the last two years but seemed to be back in form with five World Cup wins so far this season. So far the World Championships in her adopted hometown haven’t gone her way, netting just a bronze in last week’s super-G.
Thursday’s GS is Vonn’s last hope at a medal, and Maze will be gunning for her fourth medal of these Worlds and her 10th Championships medal overall. Vonn hoped to charge out and win the downhill by a wide margin but couldn’t get a feel for the rock-hard Raptor course in the morning run. The rest of the U.S. women’s team didn’t fare much better. Overall, Laurenne Ross finished 14th, Julia Mancuso 15th and Jackie Wiles 17th. The action shifts to Vail on Tuesday with the team event at Golden Peak. All races are free and open to the public. Go to the official website for more information.